You likely have a variety of questions that you want to ask when you’re dealing with rotator cuff pain. At Advent Physical Therapy, our team knows that answering all your questions is vital to your recovery process. Answering your questions is so important to us for one reason. We believe that you should be an equal partner in your recovery process. Unfortunately, if you don’t know anything about your condition, it’s impossible for you to be an equal partner. Therefore, our team is dedicated to helping you understand everything that you want to know about your condition. There are lots of common questions that we’re asked about rotator cuff injuries and the pain they cause. 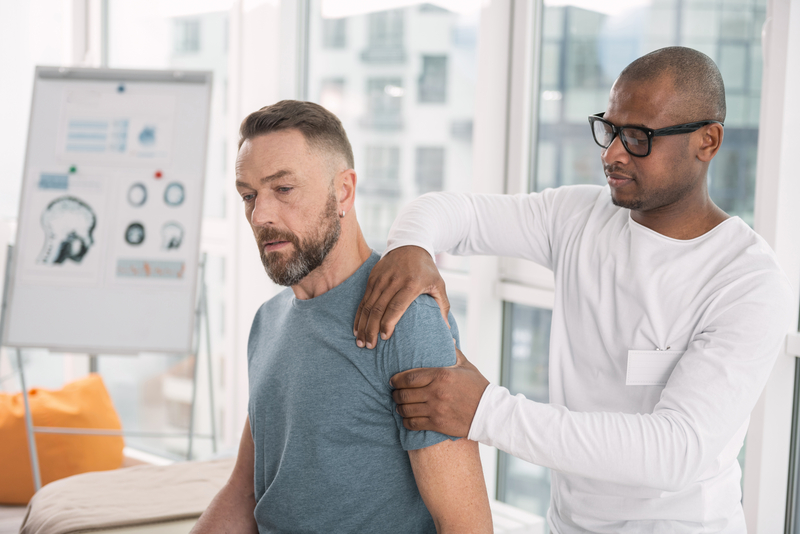 To help you become partners with us, our team offers you the answers to the top two questions we get asked about rotator cuff pain and injuries. Question #1: What are the symptoms of a rotator cuff injury? The first question that our staff is commonly asked has to do with the symptoms of rotator cuff injuries. Oftentimes, you may not be aware exactly what symptoms result from a rotator cuff injury other than rotator cuff pain. It’s true that pain is the most significant symptom of a rotator cuff injury. However, this pain has several unique characteristics compared to other types of shoulder pain. For one thing, the pain you experience will be centered over the top of your shoulder. The second unique characteristic is that you’ll experience pain if you lay on your shoulder while sleeping at night. Another common symptom that you’re likely to experience is weakness in your shoulder. This will make it difficult for you to move your shoulder and to lift even lightweight objects. Question #2: Will I need surgery for my rotator cuff pain? The question of whether you’ll need surgery for rotator cuff pain is another common one that we’re asked. The answer is highly dependent on how severe your rotator cuff injury is. Often, mild-to-moderate rotator cuff injuries won’t need surgery. In fact, your injury is likely to heal with about six weeks of physical therapy. However, a severe rotator cuff injury is likely to need surgery. If you do need surgery, though, pre- and post-surgery physical therapy can be extremely beneficial to your recovery process. Now that you know the answers to these top two questions, our team is ready to help you find out more about your condition. In fact, we can offer you a free, 15-minute screening. This screening will help us take the first step together in building our knowledge about your condition. Just contact any one of our 13 locations in the Grand Rapids, Michigan area to set up your free rotator cuff pain screening today.